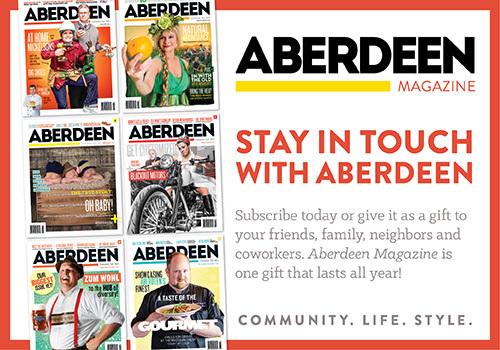 Subscribe to Aberdeen Magazine | McQuillen Creative Group, Inc.
Home / Aberdeen Magazine / Subscribe to Aberdeen Magazine! You’ll Love It! Subscribe to Aberdeen Magazine! You’ll Love It! McQuillen Creative Group brings you, Aberdeen Magazine! The only magazine in the area dedicated to all things positive and great about our wonderful city. Each issue features people, places, events, fashion, and food; all from Aberdeen. The magazine is produced totally in-house by MCG staff. We do solicit help from freelancers and eager volunteers. Take a peak at our last issue if you want to get a feel of the quality and content. If you subscribe, you’ll save a bit on the cover price and we’ll send it right to your house, where ever that may be in the country. This makes a great gift and stocking stuffer. Subscribe Now!